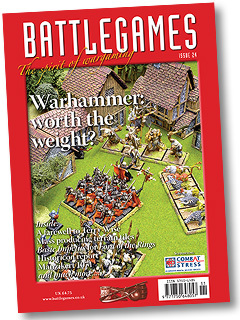 I have yet to receive my Battlegames #24, but I have been debating whether or not to renew my subscription . . . because, as you say, a number of recent issues have been "rather flat". I will look forward to reading your article. I'm glad you guys are saying this. I'm feeling the same way. I did not renew, will likely order issues as interest dictates. I like Battlegames, despite the rather flat recent issues. But I'm having doubts as one of my favourite features (Grants TTT's)has ended and I'm not sure how such a high standard/interest series will be replaced. And to be honest: I'm quite fed up with D. Sutherlands hand fetish pictures. But now that the terrain has been build and everybody knows that you can game in the sun...will that series of articles go on?... If not, there is that problem of replacing a good seven pages of regular features with other contents. But as I still believe in the "the spirit of..." concept, I wish Henry good luck with his venture and hope it will turn out well (as I have another 7 issues of subscription to go). 'D Sutherland's hand fetich pictures'! Love it! I agree. Those articles have been a strange choice to open the magazine with, and I won't be sorry to see them go. But I remain optimistic about future issues. I guess we'll see. Much of your article mirrored my own feelings about the hobby, which have led me to go back towards 'old-school' rules and concepts and plan creating two 'imagi-nations' armies, rather than attempt to recreate historical ones. My only criticism would be that you didn't put the 'anti-establishment' case more strongly! Looking back at my collection of Practical Wargamer and early issues of Miniature Wargames and Wargames Illustrated, I was struck by the far greater varity in both subject matter and presentation than can be seen in the two latter magazines under their new ownership. 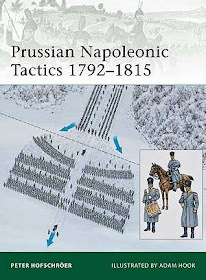 Their standard of visual presentation may have 'improved', but the tone of the articles and the image of wargaming they present has become bland and rather unimaginative, emphasising appearance over the actual experience of playing, and suggesting that great effort and expenditure must be put into creating/decorating the troops and scenery to achieve a good game. I much prefer the DIY/'Blue Peter' approach to rules and scenery of the old days! You're right Arthur. A look back at some old mags would have made an interesting comparison with current trends. Thanks for taking the trouble to give me some feedback. Just browsing older posts now that I've found your blog. I used to try and edit a magazine (HMG Magazine) and it's a bugger of a job to find good content nowadays with the blogosphere. Now anyone with anything to say puts it on a blog and gets instant gratification instead of scribbling out an article on his latest research into the tartan colours of Slobvakian bogtrotters for Wargmaers Digest. So it's a hard task for guys like Henry to get articles that are worth printing. Also for us older gamers it's very much a "nothing new here" experience. My wife experiences it with her quilting and knitting magazines. There's only so many techniques and how-to articles before one has read them all.